John Fox first went to Venice in the 1950s and then annually from the mid 1970's on. He always preferred painting lesser-known places where Venetians lived and worked. In the glimmering pinks, whites and ochres of Renaissance architecture and bathed in watery sunlight, the palazzo, its garden and entrance wall nestle behind a small square, covered by a dappled sky. John Fox's years of painting abstracts and drawing from the model stimulated his paintings of imagined people in invented places. His two men, one digging while one watches, twist and turn within their anonymous workplace. The light falling on the cropped outlined bodies, their averted faces and powerful hands, both clarifies their story and keeps its mystery. John Fox’s abstract paintings from the early 1980s often used collage, where a few pieces of canvas were cut into various shapes and sizes, then attached to the surface and painted. The dazzling colour glows and glitters like the 18th-century Venetian paintings he greatly admired. The composition suggests his own imaginary map of Venice and its Grand Canal. Titled after a Sumerian goddess, this painting has a quiet dignity and composure. The large bands of translucent colour and their narrow edges also shift and sway in a gentle movement, resembling the motion of using a paintbrush. Fox also leaves evidence of the different layers of paint, giving more clues about his process of making a painting. The bright blue fishing dory nestled in the harbour of a sea-side town is the fulcrum of this quiet, delicate narrative, where painting and drawing are inseparable. Positioned amid the dusty colours of a late summer landscape, the elegant shape of the simple boat is echoed in the outline of the buildings, weirs and even the trees. Any still life painting is like a self-portrait, where artists select objects that have personal meaning and display a part of their daily life. By presenting very different but ordinary things in a formal grid-like display, John Fox gives dignity to the everyday. Time is momentarily stopped in this intimate world of elegant colour, delicate drawing, and clear light. 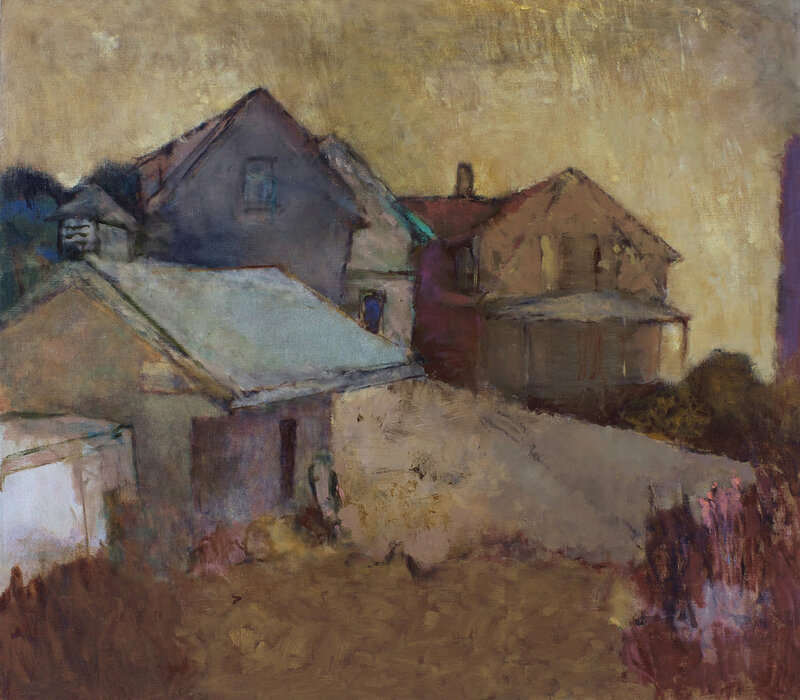 Whether painting representational or abstract images, John Fox always drew from the model. The leaning figure contrasts with the slanted chair back while the line of her arm and shoulders parallels the rungs of the chair. Watercolour was a favourite medium because it's difficult to control, but Fox's dynamic tones of green and ochre prove his mastery of his materials. In the 1990s, John Fox spent time around Damariscotta, Maine. More intrigued by the farmlands than the seacoast, he inhabited this landscape with ramshackle buildings on one side and tilled fields on the other. By adding to and subtracting from what was really there, he turns it into a world of mauves, blues and ochres, warmed by golden summer light. This unusual collage of painted and layered pieces of different kinds of paper combines quirky geometric and unnatural organic shapes. Fox's large and small patches of greens and earth colours, splattered circles, scissor-cut and torn papers, and thick and thin lines of paint, create a fantasy landscape that is both carefully composed and joyously exuberant. Transparent layers of colour are brushed, sprayed and wiped across the canvas in all directions. Vectors and rectangular lines create a loose trajectory that travels around the dome-like center and encircles its swirling tones of blue and ochre. Small patches of nearly bare canvas close to the corners of the painting bring Fox's imaginary paradise back to earth. Narrow and wide swaths of gorgeous colour gently slide over and under each other while tracings of various layers of paint add another kind of flux. The coloured bands, made by stripped-away tape, echo the edges of the canvas and embellish the center of the picture. Fox's soft geometry creates an exquisite floating world of paint and pleasure. From spring 1957 to late 1958, John Fox spent time in Honfleur, northwestern France. Its long harbour, closely-packed buildings and octagonal bell-tower have remained unchanged for centuries. Here the docked boats with their angled sails, the afternoon light moving across the canvas, and up-and-down roof lines suggest the vitality of a multi-coloured cityscape seen in a single glance. For twenty years, John Fox had a studio in the St-Henri area of Montreal, beside the Lachine Canal. He painted its jumble of factories and warehouses, streets and shrubbery as urban landscape, mixing what he saw with what he imagined. The pale tones of worn buildings against the dark colours of their surroundings turn the familiar into the exotic. This abstract work on paper shows John Fox’s lifelong interweaving of painting and drawing. Both his abstract and representational paintings began by drawing on the canvas. Here his almost airborne charcoal shapes slip and slide over colliding layers of paint. The different gestures and sensations of paint and charcoal give his tonal colour its perfect pitch. Intense deep colour and strong contrasts of dark and light describe Fox's paintings of the early 1980s. Here the expansive, shimmering surface becomes a cosmic space, where his radiating organic shapes resemble galactic nebulae that defy gravity. An elegant double loop moves across the center of the painting like a shooting star travelling across the night sky. Multi-coloured bursts of energy are created out of skeins of clashing, joyous colour. Eccentric circular shapes and shooting diagonals are created from Fox's unique method of laying down tape, painting the edges, removing it and then adjusting the colour. He used this extraordinary process, akin to drawing with tape, in combination with laying down veils of diaphanous paint. This group of vases and pitchers, flowers and sculpture is more like an interior view than a still life. The casually placed objects and a section of a room seem like a glimpse into Fox's own workplace. His bronze standing and seated female figures reflect his love of making sculpture and the sculptural feeling of the things he paints. Fox drew from the model throughout his entire career. Here the cropped figure in a slight S-shaped stance turns her head as if adjusting her pose. The curves of her body, its broken silhouette, and feathery skin tones play with the coloured rectangles of the studio wall. She is attached to the background like a figure in low-relief sculpture. The artwork in this website is available for purchase. For more information, please contact us.